Always wear eye protection when working near the battery: Working without eye protection is dangerous. Battery fluid contains SULFURIC ACID which could cause blindness if splashed into your eyes. Also, hydrogen gas produced during normal battery operation, could ignite and cause the battery to explode. 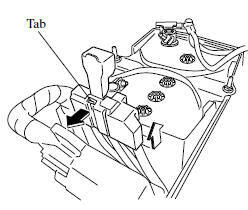 Before performing battery maintenance, remove the battery cover by pulling the tab. • Keep it securely mounted. • Keep the top clean and dry. • Keep terminals and connections clean, tight, and coated with petroleum jelly or terminal grease. • Rinse off spilled electrolyte immediately with a solution of water and baking soda. • If the vehicle will not be used for an extended time, disconnect the battery cables and charge the battery every six weeks.